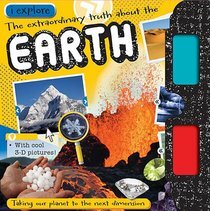 iExplore is a new range of fact books, perfect for children who want to learn more about the world around them. Discover everything you need to know about Sharks, Bugs, Dinosaurs, Extreme Animals, Earth, and Space. With vivid photography and design inspired by the world of technology, these books offer a new approach to first reference books. Each book also includes a 3-D image on each spread and glasses to view them with. Young children will love reading the cool facts and learning more about the wonders of our planet in these fun fact books. About "Iexplore Earth (Make Believe Ideas Series)"